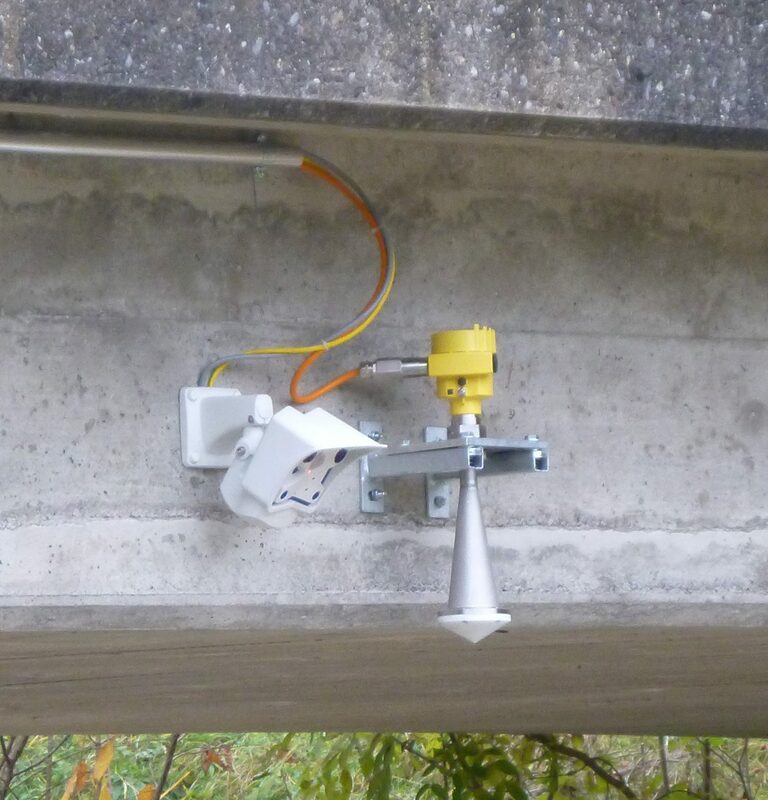 Level measurements or stream gauges are important components of any debris flow and flood monitoring station. 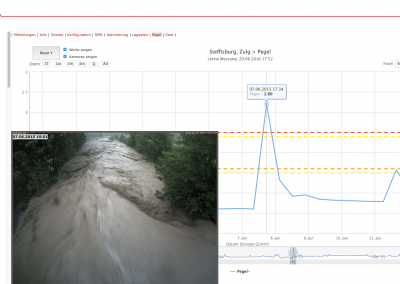 When rivers transport a lot of debris, measuring their flow height can be challenging, but modern laser and radar gauges in combination with specialized algorithms can produce reliable measurements. 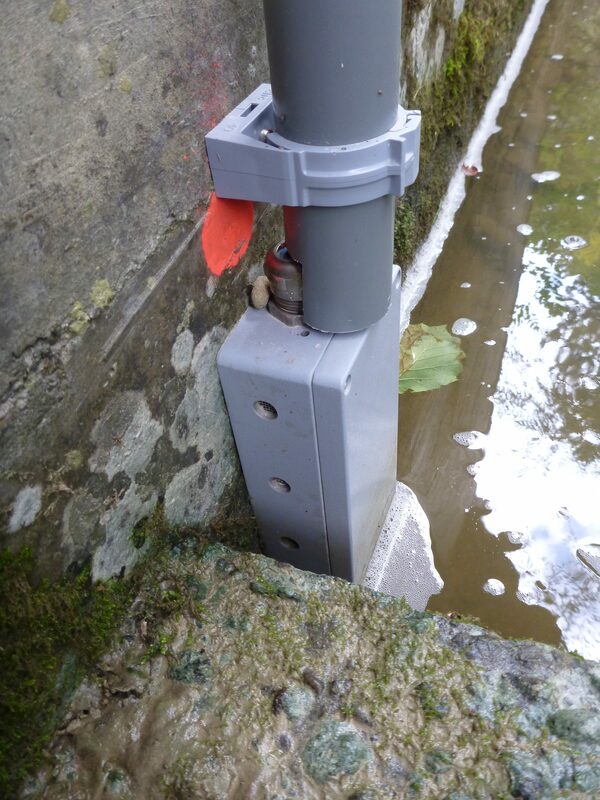 For rivers and lakes with low sediment content, pressure gauges can be the best option. Radar and laser gauges, pressure sensors, ultrasound sensors or trigger lines. Radar gauges are some of the most common stream gauges. 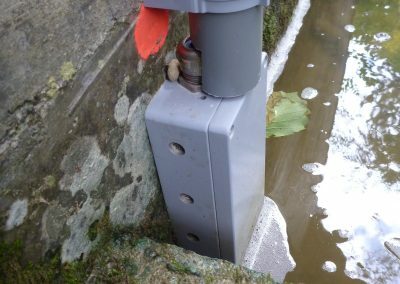 They measure the distance to the water surface day and night, regardless of visibility, are easy to maintain and can be mounted at a safe distance from the river, which makes them available during and after flooding events. Additionally, they allow continuous measurements and can easily transmit their data to the online data portal. Laser gauges work in a similar way to radar gauges, but can be more focused, giving them an advantage in narrow canyons. 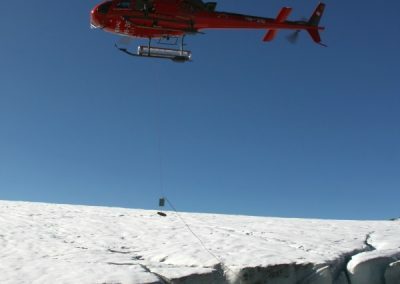 However, during heavy rain or snow, the laser can have a hard time seeing the surface of the water, which is why Geopraevent recommends radar gauges in most cases. Pressure sensors are simply placed in the lake or river and measure the pressure of the overlying water, from which the water level can be deduced. If the water is free of sediment, pressure gauges are viable alternatives or additions to radar gauges. They are slightly higher maintenance, and need to be checked for debris accumulation occasionally. Ultra sound is suitable for non-turbulent water surfaces, and the measurements are limited to distances of a few meters. Snow and rain can also distort the measurements. 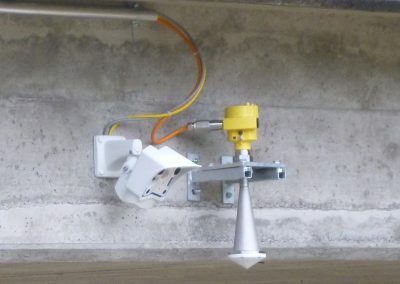 Trigger lines offer simple and cost effective alarm triggers. 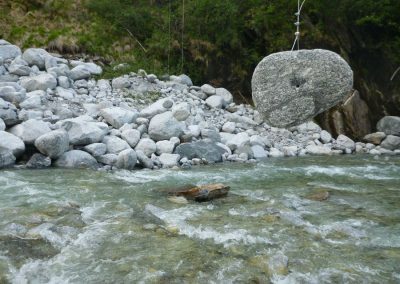 A weight dangling over the surface of the water is entrained in case of a flood, triggering an alarm. 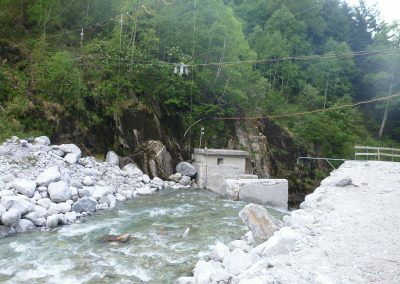 This method does not allow constant monitoring of the water level, but offers a very reliable way of knowing if a set threshold has been surpassed. 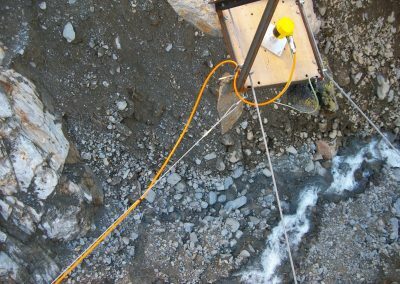 Geopraevent employs stream gauges in a variety of projects to monitor flow heights of avalanches, debris flows, flood waves of floods. The radar gauge (yellow) measures the distance to the surface of the water and the webcam provides valuable images. 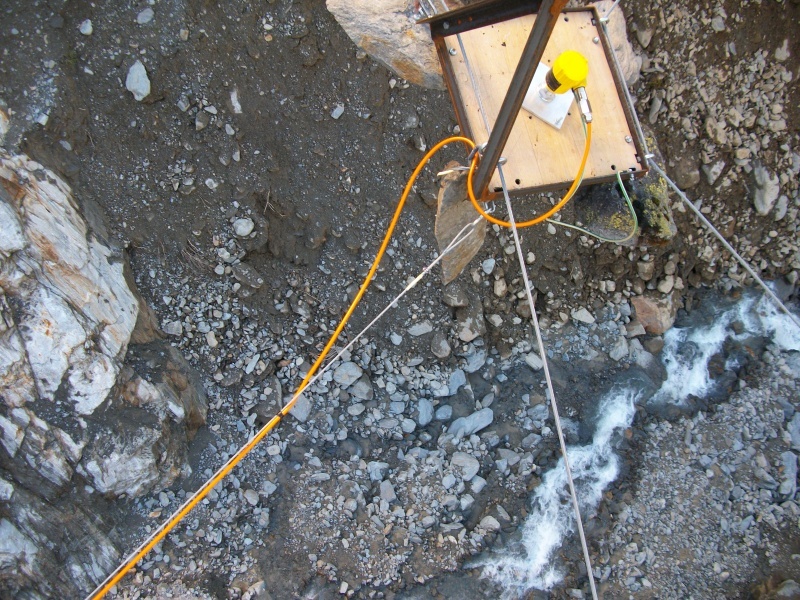 A radar gauge monitors the water level in a deep debris-flow channel. … but occasionally need to be checked for sediment accumulation. 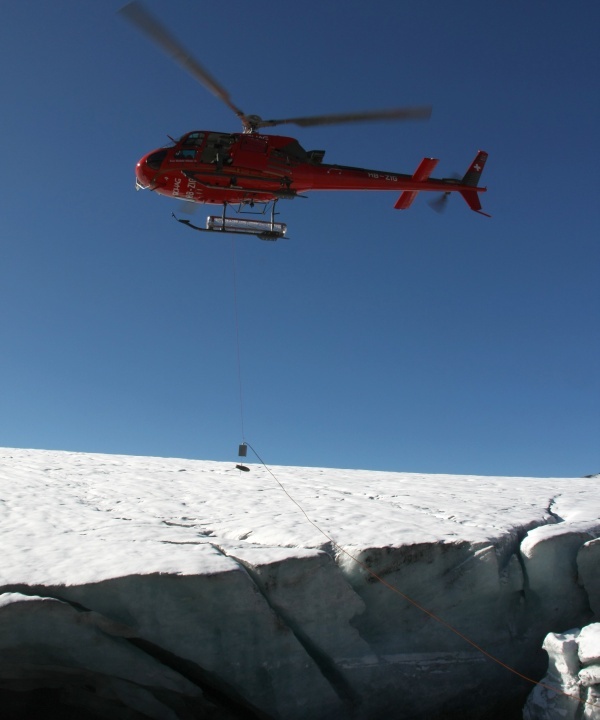 When locations are difficult to access, pressure sensors can easily be placed in a lake from a helicopter. 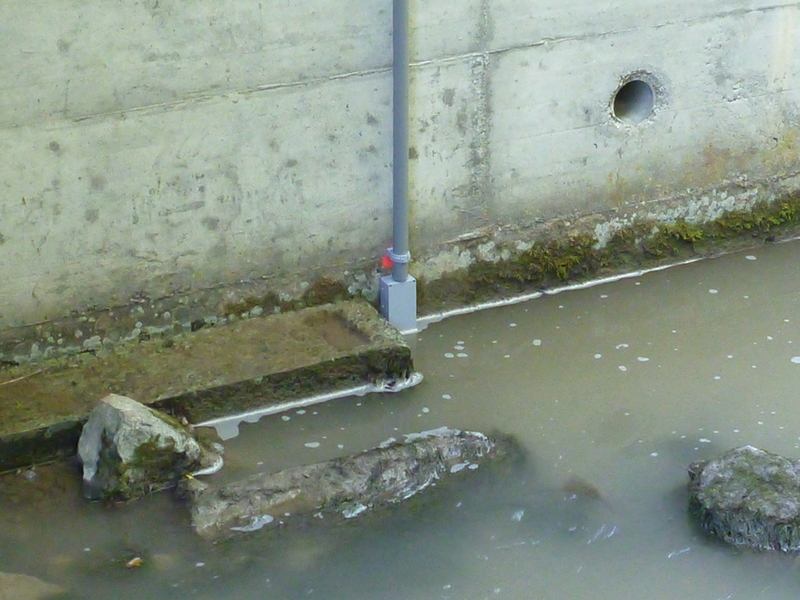 Trigger lines are simple and cost effective: They trigger an alarm as soon as the water entrains the weight at the end of the line, but they do not offer continuous measurement and need to be replaced after floods. 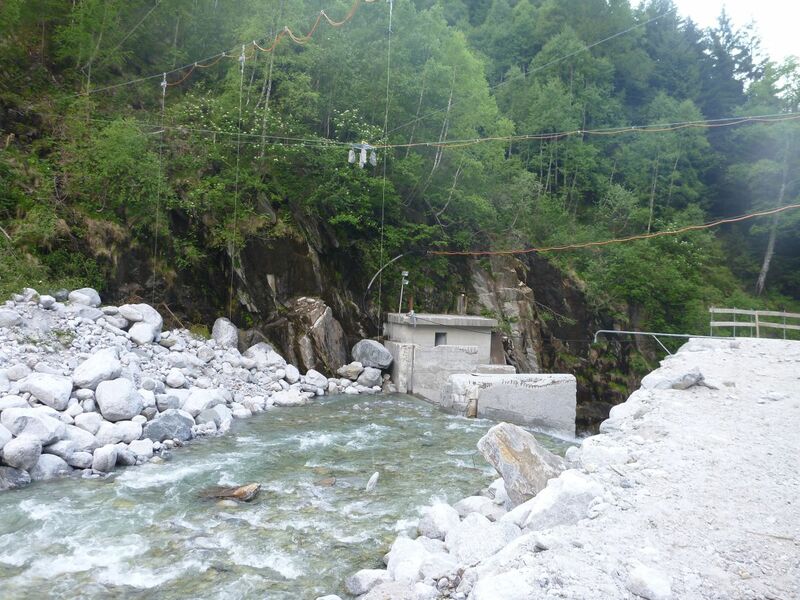 Stones attached to the end of the lines ensure that a flood entrains the line and triggers the alarm. 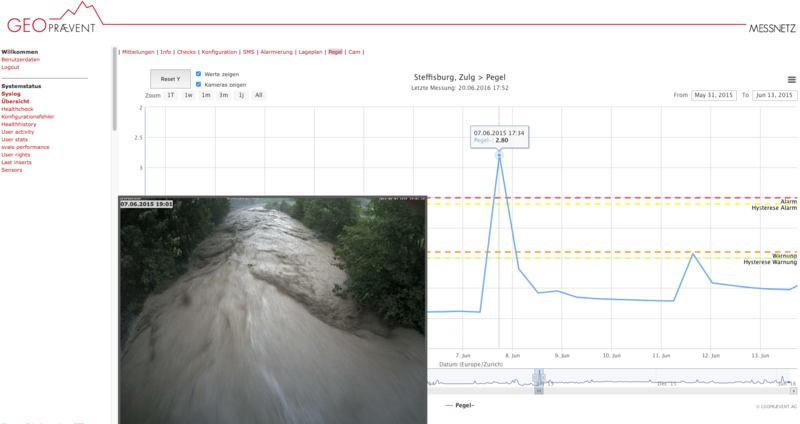 Data from the stream gauges is transmitted to the data portal, where pictures taken by a webcam are displayed as the mouse is moved over the plot.